TSAWWASSEN, BC – This special project, first and foremost, revolved around designing a barrier-free environment that accommodated easy-access and use of all spaces of the home by the clients. The original structure was a small cottage with a poorly constructed lean-to structure along it rear. Over and above the the clients desires to reorganizing the heavily partitioned interior wall to facilitate access, they envisioned the creation of an environment that was more in keeping with lifestyle and incorporated the outdoors within the spaces of the home. The result is a unique showpiece home that is finely tuned to its owners patterns and activities. 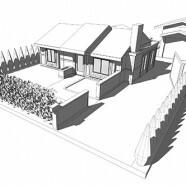 Astonishingly, the final design saw more spaces taken away from the house then added. The derelict structure attached to the original house was demolished with a small living room added along the south side of the house. This created an L-shaped design that focused all the structures on the site – office and home – around a beautiful courtyard. All activities within the home link into this outdoor room with the kitchen and living room incorporating sliding glass walls that open the interior directly into the outdoor space. The interior spaces also incorporate a number of sliding glass walls that operate dynamically to attain different levels of privacy or publicness. This ultimately creates a malleable home that closely corresponds to the physical and emotional needs of its users. The size and scale of the rear addition was intelligently in accordance with exterior spaces – ensure proper levels of light were maintained throughout the year. The window sizes and distribution were closely calibrated to views and sightlines, making the home feel larger than its modest approx. 1000 sq.ft. footprint. All efforts were made to make the most of the limited space within the home. For example, a radiant floor heating system in conjunction with two small energy-efficient fireplaces serve to heat the home – eliminating the often large spatial requirements of the typical HVAC systems. This detail was taken to the smallest scale, with the choice of furniture and accessories. Small-scale interior elements wisely chosen by the with the owners – light fixtures, doors, etc. – complete the home making it modern yet homely dwelling.